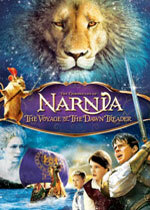 adapted as "The Chronicles of Narnia: The Voyage of the Dawn Treader"
Synopsis: The things in the picture were moving. It didn't look at all like a cinema either; the colors were too real and clean and out-of-doors for that. Down went the prow of the ship into the wave and up went a great shock of spray. Through this enchanted painting, Edmund and Lucy, accompanied by their unwilling and unpleasant cousin Eustace, once again enter the magical world of Narnia. 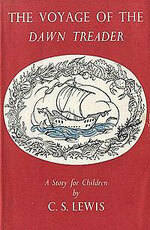 Once aboard the magnificent ship Dawn Treader, Edmund and Lucy are reunited with their old friends Caspian, the young King, and Reepicheep, the daring Mouse. They embark on a noble voyage to find the seven lords of Narnia who were banished during the dark rule of Caspian's evil uncle Miraz. Unforeseeable adventures and dangers await them as they sail farther and farther from charted waters toward the "utter East" that Reepicheep has dreamed of since his youth. It is there he hopes to find the mystical home of Aslan, the majestic Lion and King and Lord of all Narnia. Additional notes: The information link is to a more recent edition of the book.